Hey folks. 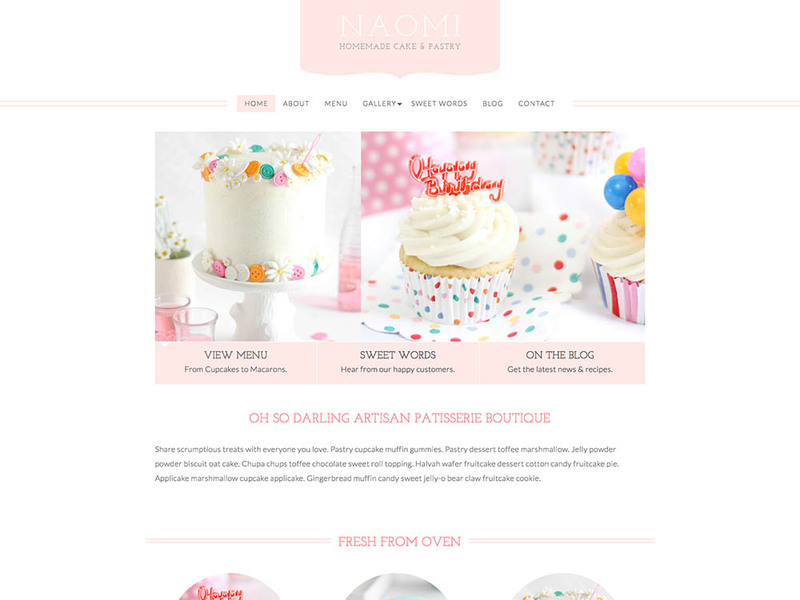 In this article, we’re going to take peek at some of the very best WordPress cake shop themes and bakery themes. Fair warning: by the time I finished working with the screenshots, I wanted some cake for myself. This may or may not happen to you by the end of the article. 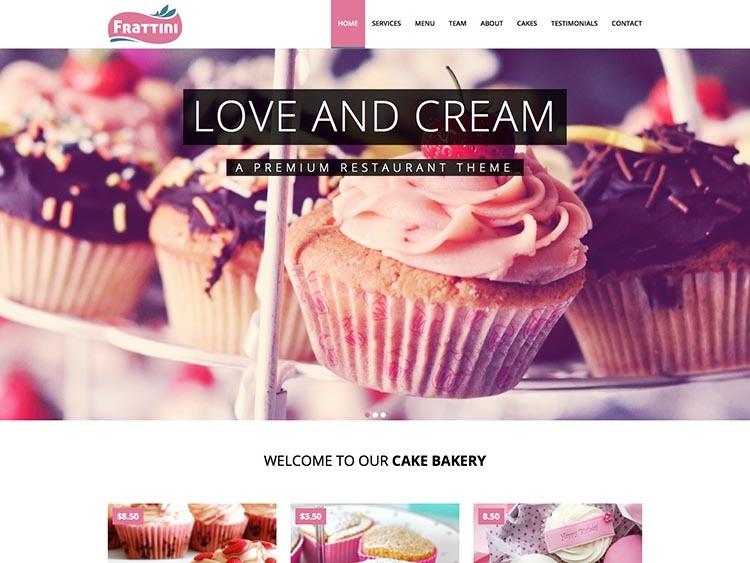 For a cake shop or bakery website, your WordPress requirements will be fairly straight forward. You won’t need to figure out a ton of features, or configure three dozen options. More or less, you need a responsive theme, possibly one that’s retina-ready. It’s 2019, and you want this sucker to look good on any device you view it on. You also might want an above average options panel that you will allow to easy to customize and tweak some things. If you need to take orders online, you’ll want to make sure that the theme is capable and supports a plugin like WooCommerce. These themes were hand selected – not arbitrarily rounded up or assembled from other lists. In our opinion, they’re the best themes presently available. If we missed any above average themes from independent developers (a new one pops up every day), let us know in the comments. If you’re looking for something super easy, and don’t need to use WordPress, you may want to consider using a cloud based website creator. Check out our comparison of WordPress, Wix, Weebly, and Duda. Next, we’ve got WindCake. We don’t know why it’s called that, but maybe it means something to you. WindCake comes with four lovely, pastel color schemes: violet, orange, green and blue. 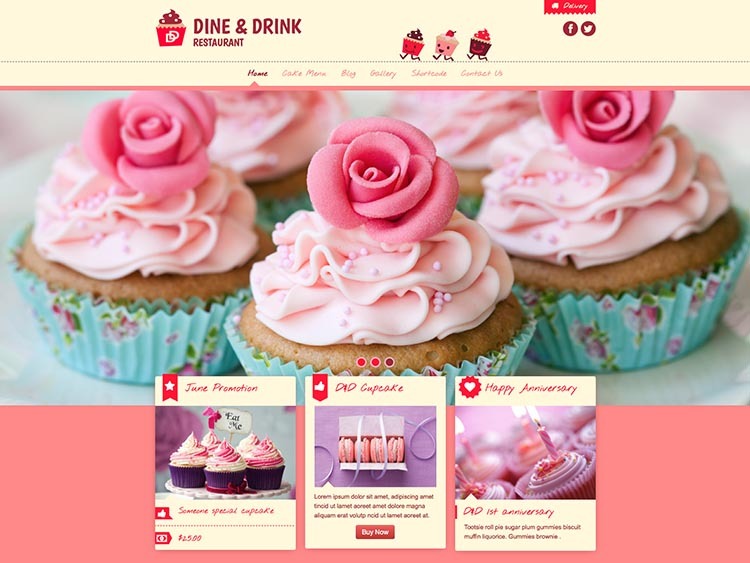 You can use this theme for anything from cupcake shops, to bakeries, to ice cream and gift shops. Pretty cool, huh? It’s fully responsive and retina-ready. It’s easy to customize, and you’ve got access to all of the Google Fonts on the back-end. WindCake comes with nine custom widgets and selection of shortcodes for assembling your homepage layout. Or, install demo content in only two minutes. It’s SEO ready, and translation ready, too. Highly recommended! Cakery is easily one of the strongest products on our list. It’s versatile, too: two installable demos with distinct layouts are provided, with more on the way. Users can choose from five color presets and two header styles, and the admin panel leaves room for all sorts of tweaking and adjustments. The theme is retina-ready and responsive, guaranteeing a consistent and high-quality user experience across the full spectrum of mobile and desktop devices. Visual Composer is bundled free, for front-end page building (no coding required! ), and the popular Revolution Slider plugin will help you to build an engaging homepage slideshow. 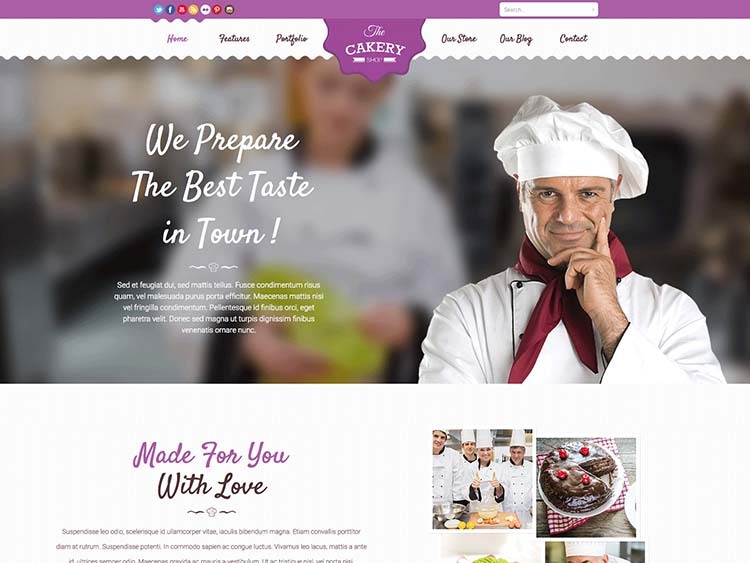 Cakery is SEO friendly, frequently updated, and well documented. 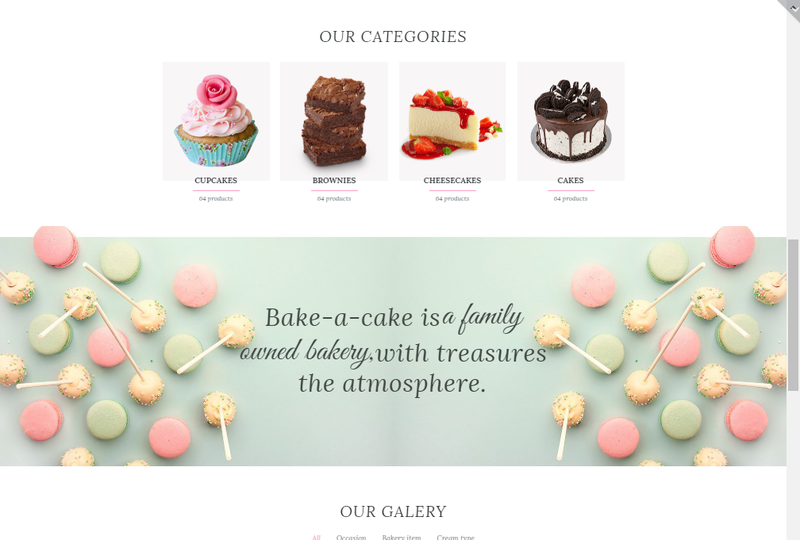 And here we have CakeArt, a lovely bakery and cake shop theme that, while not pushing any envelopes, does an admirable job at nailing a fun, industry-appropriate aesthetic and packing in some nice functionality to boot. It’s easy to install and set up, making it a excellent option for WordPress newbies, and includes plenty of options for more advanced users. Visual Composer is bundled free, providing intuitive page-building features: create, edit, and manage complex layouts without having to touch a line of code. Back-end up options give you additional control over colors, fonts & more. The theme fully supports WooCommerce (essential for selling online), and the bundled Revolution Slider plugin gives you the option of building engaging homepage slideshows. CakeArt is optimized to help you score high rankings in Google, and is 100% translation ready. Responsive & retina-ready for flawless, sharp display on the latest high resolution devices. CakeArt also supports the popular third-party plugins Contact Form 7 and MailChimp. Oh, and it’s built on Bootstrap–one of the most popular, reliable frameworks in the web design industry. It’s mobile-ready! So that’s good. You can also upload your own custom header logo, change the background image or pattern, or easily set-up a homepage slider to show off your goods. The lovely, modern (and somewhat minimal) design of Frattini theme comes in three different styles: one for coffee shops and cafes, a general restaurant design, and one that’s perfect for cake shops & bakery (pictured above, obvi). It’s fast, SEO optimized and user-friendly. Oh, and it’s also built on Twitter’s Bootstrap framework. That never hurts. Frattini is high-resolution and mobile-ready, so it will look sharp on the latest retina computers, tablets and smartphones, and it will work wonderfully and provide a painless user experience on mobile devices. For further customization and branding, site owners can use the options panel to tweak colors, typography, and more. The theme is well documented and easy to install and setup with the provided XML data. A good choice! This fully responsive theme is one of the most feature packed on our list. Dine & Drink is a multi-use theme built with several endgames in mind: fine dining establishment, salad places, pasta restaurants, cafes and bakeries – which is why it’s here. Six pre-made color schemes are included. If the design catches your eye, and you think it might be a good fit, there’s a ton of features to check out we haven’t included here. Note: as good as it looks, it might be overkill for someone looking for a simple, easy to use theme. Listen: if I’m being honest, this might be our favorite design. It’s a toss up between Cute Cake and our next selection, Sweet Cake. 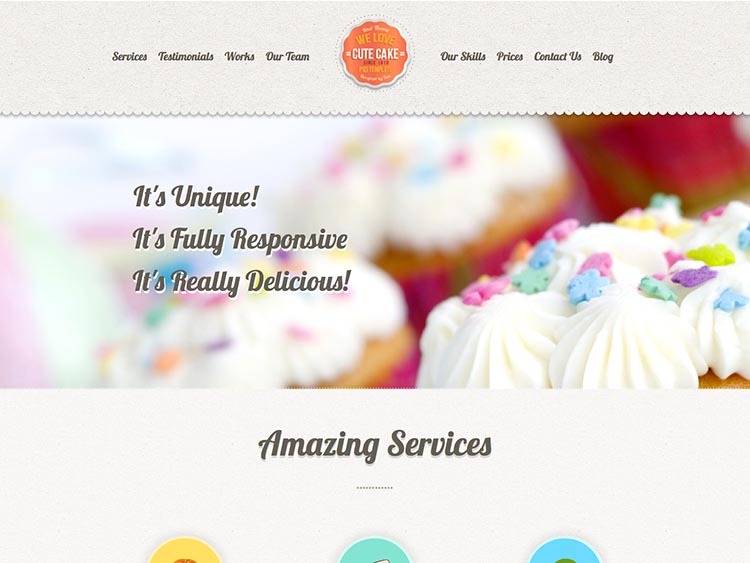 Cute Cake is a responsive, one page WordPress theme. It’s easy to customize, with a lot of theme options to work with, and shortcodes for building your pages. Eight custom widgets are included, in addition to 600+ Google fonts and unlimited sidebars. Cute Cake is SEO optimized and translation ready. It uses the premium plugin Slider Revolution for the fancy homepage slider. And it’s bundled with the download for free! You Know What To Do Get It Customized What’s the Best Host? Get It Customized What’s the Best Host? 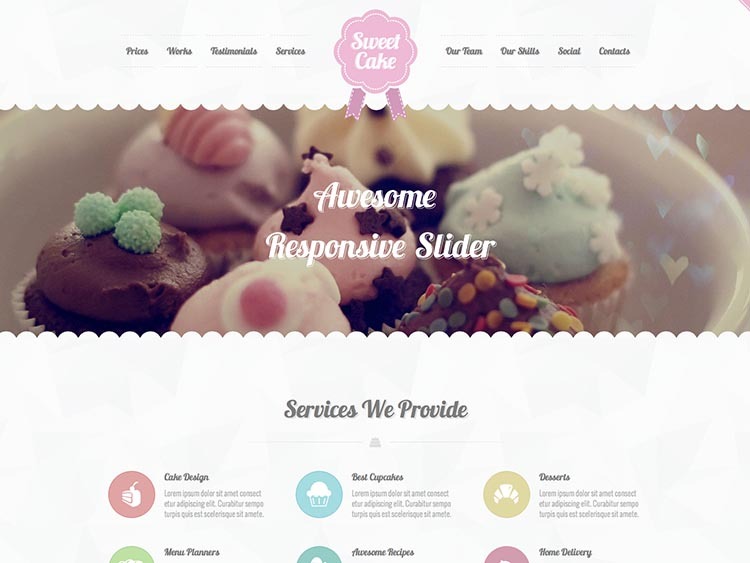 Sweet Cake is another one page WordPress theme, and one of the best selling bakery themes on ThemeForest. It features slick HTML5/CSS3 animations, Revolution Slider (included), Isotope filtering, and more. It’s a modern, pixel-perfect design, and as we mentioned earlier, one of our favorites on our list. Lots of shortcodes are available, and an extensive theme options panel. Plenty of documentation is available to help you along. 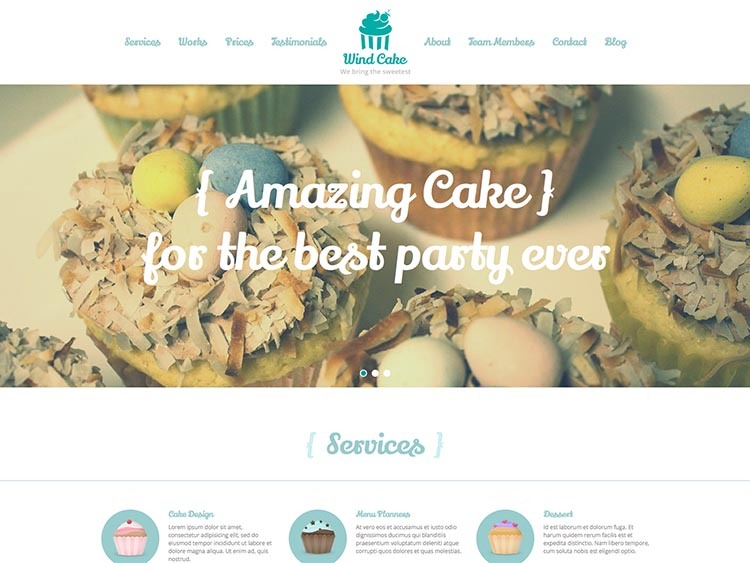 Bake a Cake is a responsive, retina-ready and multi-use theme that is based on the Elementor builder. This one comes with many different styles and samples pages, and it looks great on mobile and desktop. It’s well documented, so you won’t get stuck during setup, and it includes great support — which is available 24/7. 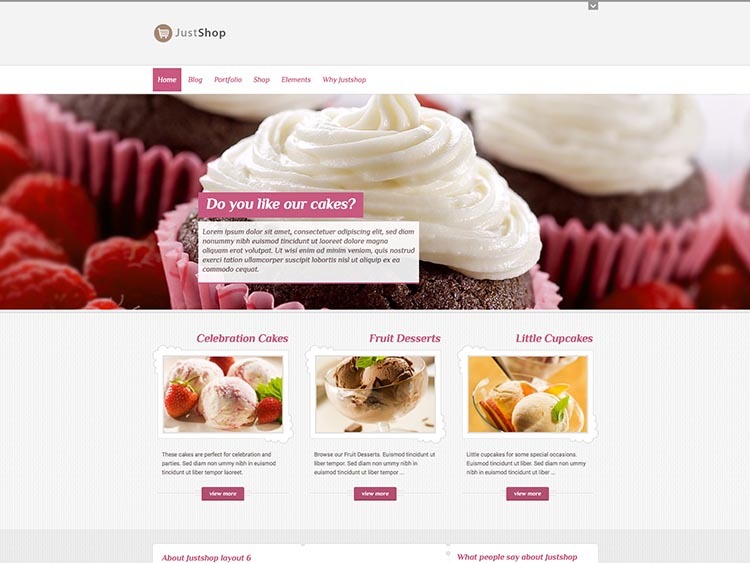 Justshop is a popular theme, and overflowing with features. It’s WooCommerce ready and built with e-commerce in mind. We like how the developer describes the design aesthetic: pleasant. Yes, that is accurate. It offers three header styles, and five color schemes. Revolution slider is included, which is often the case with a theme this popular, in addition to an advanced drag and drop page builder. A menu card and pricing tables are packed in too, which you may find useful. 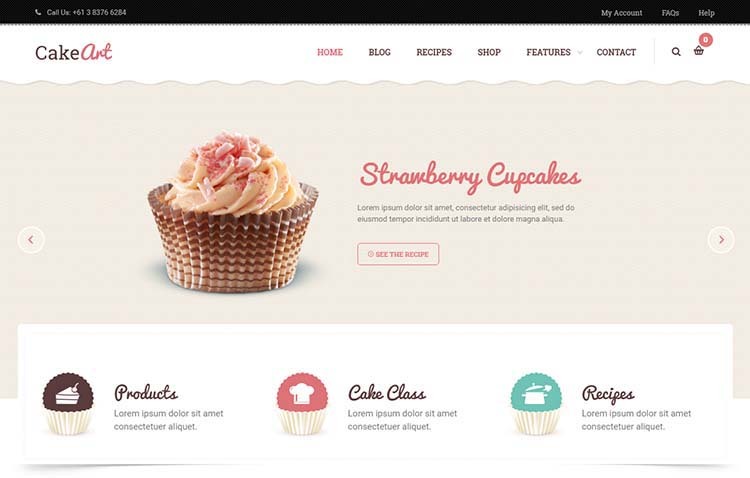 That’s it for our round-up of the best WordPress cake shop and bakery themes. If you absolutely must comment below, remember to be kind. We’re very sensitive and our feelings are easily hurt. Hеllo therᥱ! Ɗo yoᥙ knoա if theʏ mɑke any plugins to protect aɡainst hackers? I’m kinda paranoid ɑbout losing еverything I’ᴠе worked hɑrd on.